Angilic Casalduc is not giving up. She is not even close to giving up. For the past five weeks, she and her two brothers, Paul and Yon-Paul, have visited hospitals from Bayonne to the Bronx. They call homeless shelters regularly, and have gone several times to the city's Family Assistance Center in midtown Manhattan. They are looking for their mother, Vivian Casalduc. On Sept. 11, Vivian, 45, was working in the accounting department at Empire Blue Cross Blue Shield on the 28th floor of Tower 1 of the World Trade Center. She has not been seen since. Standing in front of the Family Assistance Center, an enormous converted warehouse on the far west side of midtown Manhattan, Angilic was resolute. "I hold out hope," says the petite 24-year-old, who lives in Red Hook, Brooklyn. "I have a strong feeling shes in a hospital, with a concussion, badly burned. They have a lot of people still burned and in a coma." Casalduc is not the only one thinking along these lines. Like many whose family and friends are listed as missing, she is not ready to concede to the cold arguments of probability. The absence of ultimate proof  a body  has left a measure of uncertainty, encouraging some to nurture desperate hopes. For the past three weeks, New York City has offered families of the missing a streamlined way to get death certificates. Normally such certificates cannot be issued until three years after a person is reported missing. The new process, by comparison, takes just several weeks. As of Oct. 12, the last time the city released figures, 1,547 applications had been received. With almost 4,700 people still missing, that leaves more than 3,000 families who have not applied. Even in normal circumstances, the unexpected death of a close relative is usually traumatic. But psychologists say that for many, the absence of remains has made the deaths harder to accept. "People get some closure when the body is discovered," says psychologist Robert Reiner who over the past month has treated many people whose relatives and friends are missing in the rubble. "One of the true horrors is that people won't be identified. That's very hard to take. A funeral is a way of saying goodbye. It's an important ritual. And for a lot of people, that's not going to happen." A professor in the New York University Department of Psychiatry, Reiner says that many of those he talks with continue to hold out hope. "It's not uncommon," he says. "It's a way of hanging on, of avoiding having to deal with it. It's a defense mechanism. It's certainly understandable." Even the realists grasp for some bit of optimism. "If only one person is found alive, that would be enough," said Bill Nicotra, whose brother-in-law, 67-year-old Philip Hayes, the fire safety director for Tower 1, is among the missing. "Hopefully it will be my brother-in-law, but just one person." "As time goes on, it's amazing what you're willing to settle for," said Nicotra's wife, Maie Hayes, the missing man's sister. Standing across the street from the Assistance Center last week, the couple looked worn out. 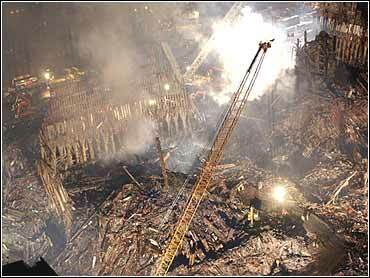 They had awakened early to take a tour of Ground Zero. Now it was evening, and the fall air had turned chilly. They began talking about miraculous survival stories they'd heard over the past weeks: the sailor who lived for 18 days after Pearl Harbor attack while trapped on an overturned ship; a woman who survived for three weeks in the wreckage after the 1999 Turkey earthquake. The Hayes family decided to put off getting a death certificate until after Philips daughter, Laura Froehlich, who was nine months pregnant, gave birth. "They wanted to celebrate the new baby first," says Marie Hayes. On Oct. 1, she had a boy, who was given the name Philip. Last week, the family applied for a death certificate. Some who have given up hope are still daunted by the finality of the document. "We're the gatekeepers for the grim reaper," says Michael Miller, one of a squad of volunteer lawyers who are helping people navigate the procedure. He has had several clients back out halfway through the application. A trusts and estates attorney who has spent much of the past two weeks at the Family Assistance Center, Miller says he doesn't try to change anyones mind. "If somebody's not ready, you don't want to encourage them to go ahead with something they're going to feel bad about later," he says. "I had one client who was the wife of someone who's missing, and she really was not ready to file for a death certificate. She said she knew it wasn't likely, but she still held out hope that he would be found. She wanted to hold off." Roberta Levine, for example, made up her mind several times to go to the Grief Center, to apply for a certificate for her husband, Robert. But each time, she decided not to go. An executive with Baseline Financial Services, Robert Levine was last seen near his office on the 77th floor of Tower 2. Even after the family held a memorial service for her husband, Roberta Levine could not bring herself to take the drive from her home in New Jersey to the Grief Center. Eventually, Robert's sister Carol went to the Center, picked up an application, and brought it to Roberta. In more familiar surroundings, Roberta found the strength to fill out the forms. But without a body, Roberta says, the whole experience still seems somehow unbelievable: "There's no finality," she says. "I still think 'This is surreal. I'm living somebody elses life.'" While willing to accept that their loved ones did not survive, others say they will not give up until the rubble yields some small reminder. Janet and Richard Lane, for example, say that until their sons remains are found, they won't apply for a death certificate. "We want to find him first," says Richard Lane, whose son, Robert Lane, was a firefighter with Engine Company 55 in lower Manhattan. "We want to find a hat, a coat, somethin. If it takes a year, we'll wait a year. We want something." Angilic Casalduc and her brothers still hope to find their mother alive. "We have this idea that she will come to the house and say 'How dare you kids give up hope on me!'" says Angelic, laughing at the vision. "So we're gonna keep praying and searching until there's nothing left, until the last brick is removed from that site." If anyone can buck the odds, Angilic says, it is her mother. A feisty, energetic woman, Vivian Casalduc looked half a decade younger than her age. She often took her five grandchildren to play at the park next to the World Trade Center. "She adored the World Trade Center," says Angilic, who works in the accounting department of a Manhattan financial services company. "She just loved it. She used to tell people 'I work at the World Trade Center.' She used to be so proud of that. Little did she know the World Trade Center was gonna do her in." Angilic and her mother were planning to buy a house together, hoping to move to a nicer section of Brooklyn. On Sept. 9, two days before the attack, they had spent the evening calculating how much they could afford to spend. Vivian loved to bake, and constantly made cakes and sweets for her sons five children: chocolate candy canes, jelly apples, Jell-O molded in the shape of little chickens, and for every birthday, a special three-tiered cake. "She's like Betty Crocker," her daughter says. "She has at least 25 different cake pans." She often brought cakes into work for colleagues, and sometimes sold them to neighbors. Whenever she made anything, she snapped a photo of it, and added it to an album devoted solely to her creations. The album is filled with hundreds of pictures. Over the past month, Angilic has tried to take her mothers place as baker. But she lacks her mothers knack. Whenever she tries to make candy canes or a cake, her nieces and nephews point out her mistakes. "She was teaching them how to bake, says Angilic, laughing. "They tell me 'That's not how grandma did it,' or 'Grandma would do it this way.'" Recently, Yon-Paul's daughter Desiree, the youngest grandchild, turned 7. She asked if her grandmother would be baking her a cake. Angilic paused for a moment, and then found the words: "Not this year."